Dreamforce ’16 is over; however we are still at awe with the amazing experience and the awesome stuff that was unveiled and learned along with the endless fun. It was full 4 days of unforgettable experience, innovation, networking opportunities, learning new ideas and solutions and of course the swags. 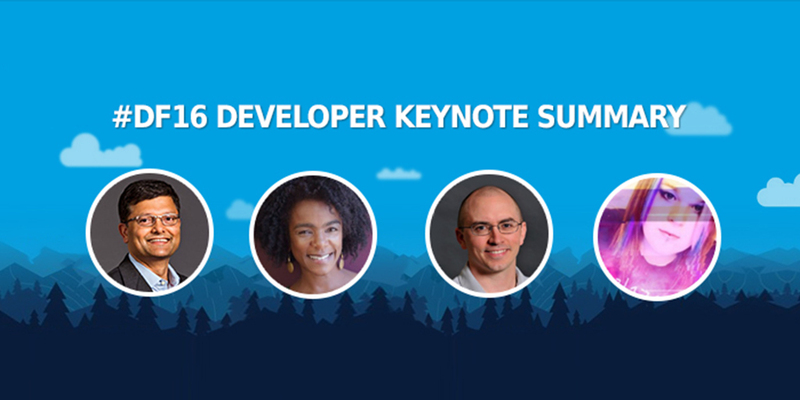 For those who had missed, we have a quick summary of the Developer Keynote Session which was one of the most talked about sessions in DF16. The key focus of the session was how to build an app with minimal code leveraging the amazing features of Lightning Design System and App Builder and to also make it smart with the all new Salesforce Einstein. They had taken the reference of a Dreamhouse App which is available in the link below for download and to explore. Lightning, the latest innovation combines user experience, framework, vibrant ecosystem of components and applications to build apps faster. With some of the new features from Winter’17, the app building process has become much easier with minimalistic code. The Dreamhouse App showcased was 80% code free. With simple mark-up, one can bind data with the lightning components. No longer apex controllers need to be written. Lightning Base Components handles all html and css which allows developers to develop apps quickly. Lightning components can be placed on utility bar and launched from an action. 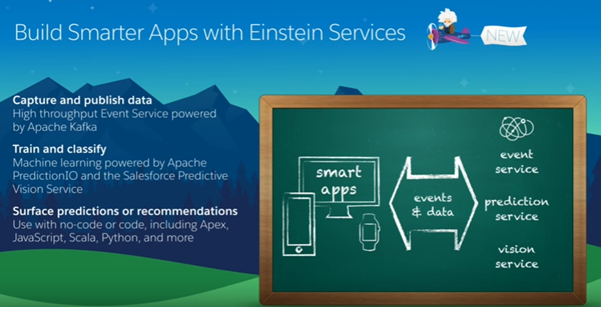 Embed Intelligence into your apps using Salesforce Einstein features. It was very beautifully showcased in the Dreamhouse App which could analyse real time data fed by users, recommend relevant options and also predict the customer behavior based on historical data and trends. Capture Real Time data through event service powered by Apache Kafka on Heroku. Have predefined models built using Machine Learning powered by Apache PredictionIO which can match our inputs to suggest and predict. PredictionIO comes with Pre-built Algorithms and the Salesforce Predictive Vision Service which can be reused. Enable Apps to predict and recommend using trained model classifiers. This was basically the hero of the show when the all new Developer UX was announced which would ease the development process for any developer. 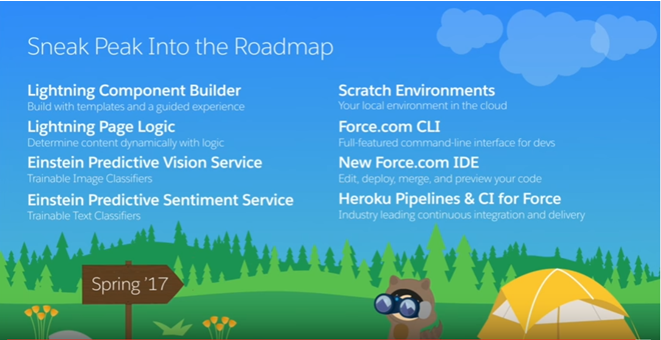 Can you imagine getting a brand new salesforce CLI having access to all those features that we used so far directly through API’s or indirectly through tools like Force.com IDE, workbench etc. along with few more new features? This would help developers to write scripts and automate processes. Building Scratch orgs – Empty orgs specially designed for developers whose characteristics can be set thru a json. Build different environments very quickly. Directly connect with source driven environment to move data and metadata to the scratch org. A local developer workspace. Use the tools you like Git, Selenium, Eclipse, Sublime, and more. CLI commands are available in Force.com IDE. Load the right tools in the Force.com IDE itself. For e.g. – Lightning App Builder. Brand new Test Runner that run in CLI which uses the various test frameworks like Selenium. Move the metadata from the org to the repository using the CLI. Also use Hereko Pipeline to drive the new Salesforce DX.